Skeptics in the Castle – We’re Talking Wine! We are letting our hair down and popping open the bottles for our meeting of Cork Skeptics in the Castle on Saturday 10th of December. Blake Creedon from the Irish Examiner will be talking about a subject close to all our hearts: wine. Does wine make you live longer? Does it make your healthier? Does the temperature matter? Does swirling the wine around make the difference? Is it the grapes or are our minds playing tricks on us? How much should we trust the wine experts? What do wine myths tell us about similar products? Blake Creedon, avowed wine fan and columnist with the Irish Examiner, is a man on a mission. In a wide ranging discussion, he will debunk memes and media stories about wine, and highlight an empirical study that casts doubt on every health claim ever made on behalf of wine. He’ll also outline why wine fans should be skeptical of sideline commentators such as himself. Thankfully, it won’t be all talk. 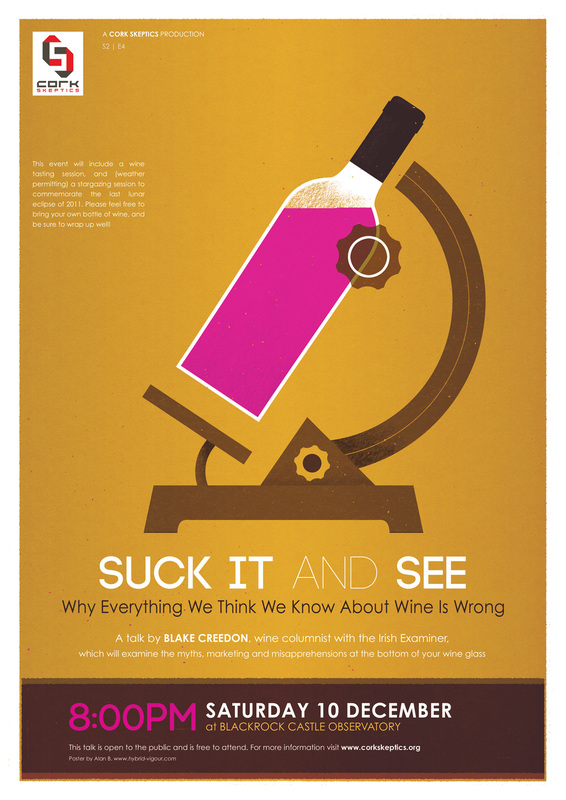 Blake will back up this suggested skeptical approach with a printout providing a chart of the most popular myths about wine, links to useful scientific studies, eye-watering evidence of how distorted our perceptions really are, and – in a comedy corner – some of the frankly outrageous claims made on behalf of purportedly magickal wine products. Bring your own wine and enjoy a fun tasting session and stargazing in Blackrock Castle with some suggestions on how to set your taste buds free! Weather permitting, we will also be treated to a star gazing session in the grounds of the castle. The talk will start at 8.00pm, on Saturday December 10th (please note that this is a change from our usual Friday night schedule). It is free to attend, and open to everyone over the age of 18. 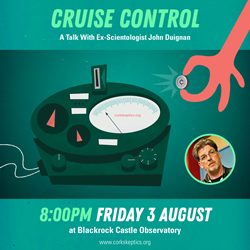 For directions to Blackrock Castle, see our Skeptics In The Castle information page. Categories: Events, General, Psychology, Science, Skepticism, Skeptics In The Castle, Woo | Tags: blake creedon, drink, Food, health, irish examiner, marketing, myth, perception, skepticism, skeptics in the pub, wine, wine tasting, woo | Permalink.